Immersion into virtual reality (VR) is a perception of being physically present in a non-physical world. The perception is created by surrounding the user of the VR system in images, sound or other stimuli that provide an engrossing total environment. Tactical immersion: Tactical immersion is experienced when performing tactile operations that involve skill. Players feel "in the zone" while perfecting actions that result in success. Strategic immersion: Strategic immersion is more cerebral, and is associated with mental challenge. Chess players experience strategic immersion when choosing a correct solution among a broad array of possibilities. Narrative immersion: Narrative immersion occurs when players become invested in a story, and is similar to what is experienced while reading a book or watching a movie. Staffan Björk and Jussi Holopainen, in Patterns In Game Design, divide immersion into similar categories, but call them sensory-motoric immersion, cognitive immersion and emotional immersion, respectively. 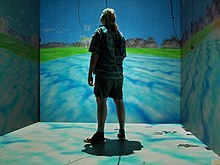 In addition to these, they add a new category: spatial immersion, which occurs when a player feels the simulated world is perceptually convincing. The player feels that he or she is really "there" and that a simulated world looks and feels "real". The central nervous system would obviously need to be manipulated. Whilst non-invasive devices using radiation have been postulated, invasive cybernetic implants are likely to become available sooner and be more accurate.Molecular nanotechnology is likely to provide the degree of precision required and could allow the implant to be built inside the body rather than be inserted by an operation. Video games from simple arcade to massively multiplayer online game and training programs such as flight and driving simulators. Entertainment environments such as motion simulators that immerse the riders/players in a virtual digital environment enhanced by motion, visual and aural cues. Reality simulators, such as one of the Virunga Mountains in Rwanda that takes you on a trip through the jungle to meet a tribe of mountain gorillas. Or training versions such as one which simulates taking a ride through human arteries and the heart to witness the buildup of plaque and thus learn about cholesterol and health. ^ Barfield, Woodrow; Zeltzer, David; Sheridan, Thomas; Slater, Mel (1995). "Presence and Performance Within Virtual Environments". In Barfield, Woodrow; Furness, III, Thomas A. (eds.). Virtual Environments and Advanced Interface Design. Oxford University Press. p. 473. ISBN 978-0195075557. Wikimedia Commons has media related to Immersion (virtual reality).